The customer service process or customer service supply chain is critical to organisations, sadly many organisations pay this “lip service”. An ongoing experience with BT retail demonstrates how dysfunctional this can become. I rarely shame companies but in my frustration it seems appropriate. Research by Karl Albrecht & Ron Zemke shows that truly Customer Centric organisations exhibit the following characteristics. I often work with companies and get them to rate themselves out of 10 on the above dimensions. How would BT Retail rate themselves? But more importantly how would customers rate BT? Interestingly for the past few weeks as a customer I have been trying to get a telephone line, calls and broadband package installed for my daughter. It would seem however that the silo approach to customer service and not recognising customer service is a critical cross functional and cross organisation supply chain has resulted in the most frustrating and worst experience I have had in over 20 years. I have been lied to on multiple occasions and it seems the system is set up to ensure issues cannot be escalated so powerless customer support individuals can do nothing. Before explaining the case in detail let me summarise the key issues to date. (I will continue to update this as things develop so do come back). 1 days holiday taken for wasted engineer visits and we are expected to take more time out for this. Paid over £150 for line rental and direct debits are being taken despite no service! Texts stating will be called back, no call backs received. 0800 number provided but if you no phone this costs you on a mobile! Out of 7 promised call backs only one received. In my household a promise made and not kept is a lie. I do hope senior management from BT Retail may take note and review their customer care procedures. I will continue to update this blog to further document any further bad and good practice. But enjoy the timeline below (Read More) and ask what would your business do differently? Building a resilient supply chain is increasingly important for all organizations. It is however something that cannot be done overnight. It involves all areas of the business and requires an effective strategy and will impact on everything from product and service design to the cultures required within the business. 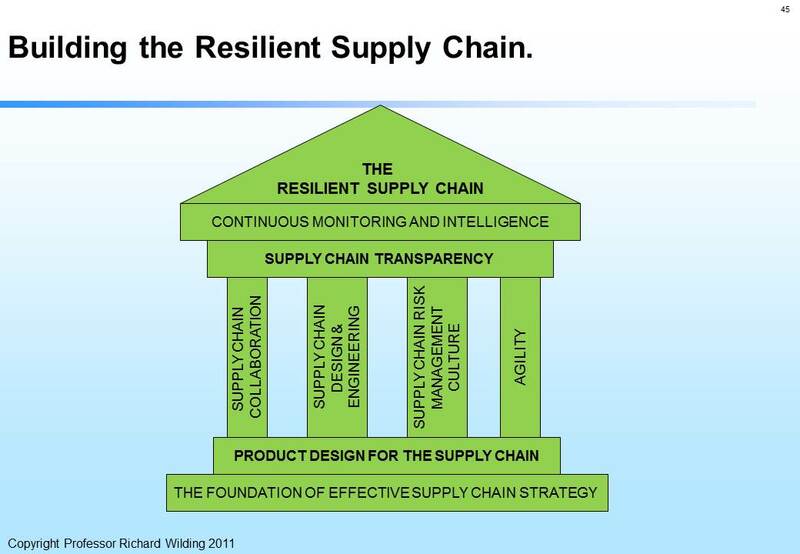 If you are concerned about risk & vulnerabilities in your supply chain build the “Temple of Supply chain resilience”, this blog (and video) briefly outlines how to build this temple. Over the past few weeks I have had the opportunity to advise the BBC on a feature that went out on Radio 4’s PM show (5.50pm 05/07/2012) and was then published in more depth on the BBC website as the “Parcel Conundrum” under the magazine section. I heard from the BBC producer and reporter Andrew Bomford over the weekend. The web page was the 2nd most read on Friday (06/07/2012) and received 682,000 views in one day! The BBC have also been inundated with emails in response. I have also been inundated with emails and ideas on how the issues can be dealt with. In addition to the content produced by Andrew and the team at the BBC I feel it may be useful to outline some of the technologies and options that may drive future trends in home delivery. Feel free to comment or add further useful links to organisations and sites relevant to this debate. Understanding Supply Chain cost drivers. Understanding the cost drivers in the supply chain has always been a major issue for organisations. It is critical to gain transparency of costs in the supply chain but for many organisations this proves difficult and elusive. In order to manage effectively, the relationship between service and cost needs to be clearly understood to enable profitability of all the elements in the supply chain. In this blog I thought it worth revisiting the fundamentals of “Cost to serve” and “Supply Chain Finance”. Are your logistics & supply chain fit for the London2012 Olympics? The Olympic games is Britain’s largest peacetime logistical exercise, it is equivalent to running 26 simultaneous sporting world championships at the same time. It is anticipated that 9 million spectators will be attending the main games and 2 million spectators attending the Paralympic games. In total over 300,000 athletes, officials, media, games “family members” and workforce will also be in attendance. London tourism chiefs are anticipating 500,000 people will be looking to stay overnight in London during the games. The games are taking place in the heart of London during the summer which is always the busiest time. In June “soft openings” occur of venues and the Olympic village with the official opening of the Olympic village on the 13th July and its closure on the 14th September so for a period of 3 months the Olympic party will consume the city. However the implications of this event on the way logistics & supply chains operate is significant. Professor Richard Wilding is interviewed and quoted by "Procurement Leaders Magazine" on "After the flood - lessons from Thailand". 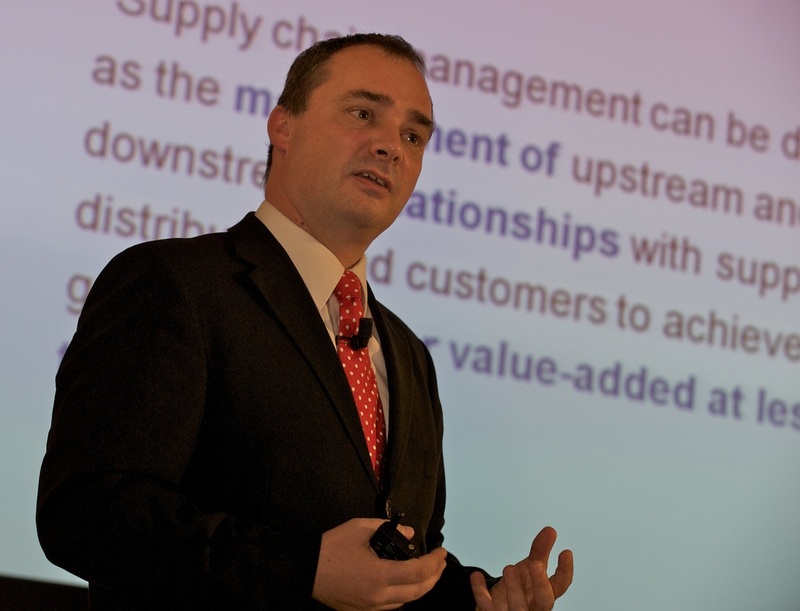 How good is your supply chain risk management? How much does time cost you in the supply chain? The need for time based decision making. Time is Money in the supply chain! We all know the saying “Time is Money” but how often when involved in making procurement supply chain decisions is time taken into account? Henry Ford proposed in 1926 that “Time waste is more important than material waste in that there can be no salvage”. In other words if reading this is a complete waste of time to you your time will never be reimbursed! On the other hand, if you were to print this out, you may be able to recycle the paper and salvage some material! But when we come to supply chain, logistics, procurement and sourcing how much are we willing to pay for time? Is time factored into the price we pay, is it considered as part of the decision? Do you understand the true costs of time when you procure or make another supply chain management or logistics decision? For example, it is not uncommon for a low cost global sourcing decision to extend the cash to cash cycle from 8 weeks (if locally sourced) to 19 weeks when sourced globally. What is the cost of this to the business in terms of increased risk, the cost of funding additional inventory and the cost of reduced responsiveness? What is the cost of having to manage highly variable ocean transit times which means your items may arrive plus or minus 10 days from the due date originally promised? What is the cost of the increased safety stock you carry to cover this increased time and time variance? Can your “Just in Time” systems cope with this? As a procurement or supply chain leader the true cost of time needs to be understood and disseminated to your team. Without considering the “T” word, TIME, the “P” word, PROFITS, will be destroyed even if you did reduce the “piece” price significantly. Avoiding the Blood bank "perfect storm" threat in 2012. _ Managing the blood supply chain. Today (28th December 2011) the BBC has run an article titled “Blood Bank “Perfect Storm” Threat for 2012". It argues that blood stocks in the UK may be hit by the Olympics, Queens Diamond Jubilee and other events this year. This is due to a potential drop in donations. For many years I have had the privilege of working on the blood supply chain supporting NHS Blood Stocks Management Scheme, so it seems appropriate to look at the blood supply chain and understand this threat and what we can do to avoid it.